The slowly dying big cat claims he was expecting some sort of majestic, cosmic glow to surround him. THE SERENGETI—According to a male lion currently dying on the Serengeti Plain, his agonizing demise certainly doesn't seem as though it's part of some transcendent cosmic circle of life, but rather as if he’s slowly and painfully bleeding to death. "I could be wrong, and maybe this is all an enchanting and noble chapter in life's great cosmic narrative, but right now it pretty much just feels like I'm dying alone on the ground in a puddle of my own blood," said the 500-pound big cat, releasing a deep moan as violent spasms seized his body. "Shouldn't I be feeling a stirring sensation of kinship with all living creatures or something? Yeah, I'm not getting any of that." "Plus, I was illegally shot by a poacher. How does that fit into this ancient, majestic cycle in which all of nature is connected as a unified being?" the lion added. Observing his surroundings, the moribund lion reported that he has seen no brilliant gleaming light shining down from the heavens that makes him realize he's part of a sacred tradition as old as life itself, nor has a hush seemed to fall over the land in a reverent acknowledgment of his passing. In addition, the large African mammal noted that succumbing to a gunshot wound hasn't resulted in a spiritual awakening in which he suddenly feels at one with the universe, so much as it has made him feel terrified, alone, and utterly insignificant. "I guess I thought there'd be a choir of chanting, melodic voices, and that all the animals of the African valley would gather on a distant ridge to respectfully view my last moments and recognize our essential interconnectedness," said the lion, drawing his last labored breaths. "But there's nobody else around at all, except those vultures." Added the lion, "Am I supposed to feel pride and great dignity knowing that my body will decay and a bunch of birds will eagerly tear into my rotting flesh with their beaks?" 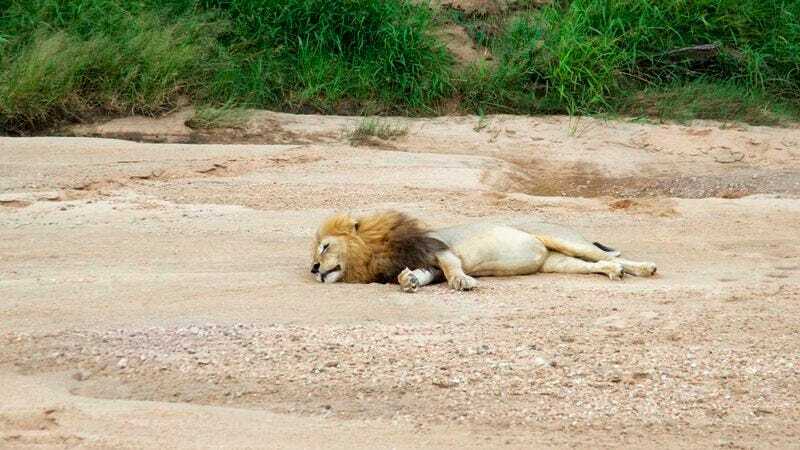 As he closes his eyes for the final time before yielding to one last series of convulsions, the lion is reportedly pondering whether shitting all over himself really played any role at all in some vast, beautiful, and endless saga of life, death, and rebirth.